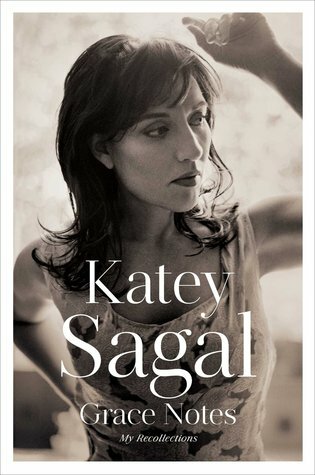 From Goodreads ~ Popular and award-winning star Katey Sagal chronicles the rollercoaster ride of her life in this series of evocative and beautifully written vignettes, resulting in a life story recounted unlike any other Hollywood memoir you’ve read before. Sagal takes you through the highs and lows of her life, from the tragic deaths of her parents to her long years in the Los Angeles rock scene, from being diagnosed with cancer at the age of twenty-eight to getting her big break on the fledgling FOX network as the wise-cracking Peggy Bundy on the beloved sitcom "Married … with Children". Sparse and poetic, Grace Notes is an emotionally riveting tale of struggle and success, both professional and personal: Sagal’s path to sobriety; the stillbirth of her first daughter, Ruby; motherhood; the experience of having her third daughter at age fifty-two with the help of a surrogate; and her lifelong passion for music. Katey Sagal is an actress and singer/songwriter and this is her story in her words. Katey is the oldest of five children born to singer, Sara, and director, Boris. Her mother had health issues and passed away when Katey was about 20. Her father passed away five years later, in a helicopter accident. Katey's dream was to be a singer but took some acting jobs to get her in the union so she'd have health insurance. She eventually landed the role of Peg Bundy in Married ... With Children and has had major roles since while still pursing her love of singing and songwriting. In the book, Katey tells of her childhood and teenage years ... turning to drugs and booze which helped her have a better self-image of herself. She talks about some of her relationships along the way, of her three marriages and her three children (the first two when she was about forty and the third when she was in her early fifties using a surrogate). She became sober and drug-free just before Married ... With Children. I liked this book and found her story of where she came from and who she is today interesting (I like reading bios/autobios). I watched her in Married ... With Children (groundbreaking for its time) but haven't seen her in the series she's been in since (I don't watch as much TV as I used to). Readers will find the writing style different but I liked it. It's not overly detailed but gave me enough to get the gist of who she is and her story. As a head's up, she likes to swear a lot (the F-bomb is one of her favourites) but I was okay with that. I think it lent to the honesty and authenticity of who she is.